Take the Chakra Test and discover whether your Chakras are open, closed or overactive. Chakra is a Sanskrit term, which means wheel or disk. Chakras are the energy vortices at a sub-atomic level of your spiritual body. They are the spiritual DNA holding the trace memories from past lives and act as the input centres for the cells of the body. The Chakras are the physical manifestation of the soul in the human body. Simply put, the Chakras are the Soul in a physical sense. The Major Chakras are the most important energy centres of the body. They are the openings for life energy to flow into and out of our Aura. They vitalize the physical body and bring about the development of our self-consciousness. Chakras are spinning vortices that receive, assimilate and express our vital life energy. When the flow of energy in one or more of the Chakras becomes blocked, we may develop physical and mental illnesses. The ancient seers perceived the Chakra system as a column of energy centres that extends form the base of the spine to the top of the head. 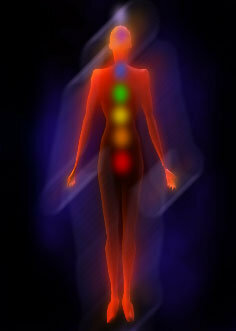 The location of each Chakra loosely corresponds to an area of the body’s anatomy and is associated with a specific colour. Located at the base of the spine, at the cervix. The last and slowest spinning Chakra this centre governs security and the grounding of ones energies. This is the security of the soul in this embodiment for guarantee of physical health, well-being and survival. Relates to: Pelvic cavity/area, reproductive system, ovaries, prostate, testicles. Located below and to the right of the solar plexus, the Sacral Chakra governs how we honor our physical kingdom. It helps us to maintain our physical nature in balance with our spiritual natures. Helping to ensure we are caring for both to live as a balanced healthy 'whole' individual. This centre vibrates with an orange glow, much like the colour of a pumpkin. Located where the rib cage meets at the bottom. It represents the creative center, where transition takes form and shape. This centre fosters the co-creation with the soul and helps the physical body manifest issues, situations and so on. It works with the Third Eye chakra to receive ethereal information and process it on a conscious level. Where the Third Eye "sees" ethereal energy, the solar plexus "feels" ethereal energy. This could be the source of the saying "gut feelings". This Chakra vibrates with a bright yellow glow. When the Solar Plexus Chakra is under-active, you tend to be passive and indecisive. You're probably timid and don't get what you want. Located in the centre of the chest, next to the heart. The Heart Chakra synthesizes the spiritual and physical natures in harmony, love and compassion. This is the centre of unconditional love both internal to the individual person and external to others and situations that occur in ones life. It is considered to be the center of Divine love or creation/expression of Divine love. This Chakra vibrates with a green glow. Located in the throat. This Chakra represents the Will centre or the centre of choice. It is the coming together of the higher and lower Chakras creating the sound of choice, what you say or want to say, whither it's vocalized or not. It is the source where spiritual will blends with physical choices. This Chakra vibrates with a blue glow. Located between the brows, in the centre of the forehead. Also known as the location of the "third eye", this Chakra is considered to be the gateway to the higher self. It reflects the oneness of the individual spirit with the oneness of the Universal Divine Spirit. This is also where you receive spiritual communications through vision or ethereal sight. This is where you "see" from a psychic perspective, much like the solar plexus "feels" from a psychic perspective. This Chakra vibrates with a violet glow. How are Chakra’s and Magick Related? Because our Chakra System is the physical manifestation of the soul in the body, it is also part of our connection to the Divine. By repeatedly opening, expanding, and closing the Chakras you are make them stronger, just as you would strengthen a physical muscle by exercising it. This will increase your psychic and magical abilities. Begin by finding a comfortable position and releasing all tension and anxiety. Imagine a ball of red light in the Root Chakra, at the centre of your lower pelvic region. The ball of light should be clear and bright. If the light is muddy or clouded, or if it is dull, take a moment and will it to become clear and bright. When you have the image of the ball of red light at the Root Chakra clear in your mind, move to the 2nd Chakra. For women this will be the mid-abdominal region, for men it will be at or just above the testicles. Imagine a ball of orange light here, and again if the light is muddy or dull, take a moment and make it clear and bright. As you make the ball of orange light in the 2nd Chakra, continue to hold the image of the red ball of light in the Root Chakra too. You may not be able to do this at first, but as you practice it will become easier. As you move to each successive Chakra, try to hold the image of the balls of light in the previous Chakras, so that at the end of the exercise you will be visualizing seven balls of light all at once. Now move on to the Solar Chakra. Imagine a ball of clear yellow light in the Solar Chakra, in the centre of your trunk, behind your navel. Again, make sure the light is as clear and bright as possible. Try to hold the image of the orange and red balls of light you have already opened in the previous Chakras as you create this ball of yellow light. When the image of the ball of yellow light is clear in your Solar Chakra, move up to the Heart Chakra. Create a ball of clear green light in the Heart Chakra, at the centre of your chest, behind your sternum. Make sure the light is clear and bright. Try to hold the image of the previous three balls of coloured light as you do this. Hold the image of this ball of green light and the three which preceded it as you move on to the Throat Chakra. Imagine a ball of light blue light in the centre of your throat. Make the light as clear and bright as possible. Now move on to the Third Eye. Behind the centre of your forehead imagine a ball of deep blue light. Make that deep blue light as clear and bright as you can, forcing out any muddiness or occlusion. Try to hold the image of all of the balls of light you have already opened, as you create the ball of deep blue light at the Third Eye. When the ball of deep blue light is clear in your mind, move on to the Crown Chakra. Just above the top of your head, imagine a ball of violet light, beautiful, clear, and bright. Try to hold the image of all seven balls of light at once. Hold this image for a few moments. You have now “opened” each of the seven Major Chakras. Now you are ready to go back down. It is extremely important to close the Chakras back down after you have finished working with them, and you must make sure you always do this. If you do not, you may find yourself extremely un-grounded. If that should happen, you only need to close the Chakra and clear and release the energy, but it is much better to avoid the problem in the first place. Begin with the Crown Chakra. Imagine the ball of violet light you have made begin to shrink. See the ball of light grow smaller and smaller until it disappears. Now imagine a tiny open door, and close it. Now do the same with the ball of deep blue light you have created at the Third Eye. See it grow smaller and smaller until it disappears. Then see a small open door where the ball of light was, and close it. Repeat this for each of the Chakras as you go down: Throat, Heart, Solar, 2nd, Base. Now clear and release all excess energy as you know to do. When you first try to do this exercise you may find it difficult to hold the image of all seven balls of light at once. Do your best. It doesn’t matter if you can’t do it at first -just go from one to the next. As you keep trying, you will find it easier. From Astral Pathways -- Guidance to spiritual growth.